Hypercoasters are all about extreme height, speed, and airtime, and Nitro delivers on all three fronts. 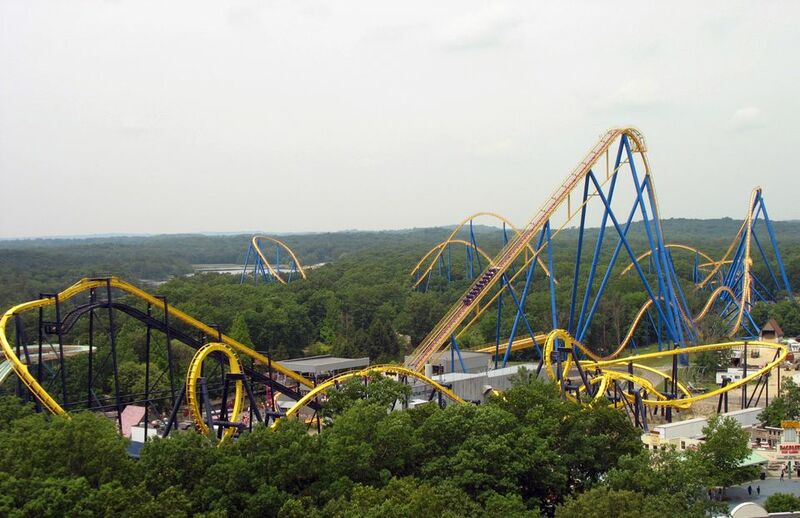 Incredibly smooth and exhilarating, it is a must-ride at Six Flags Great Adventure. Note that unlike most coasters, the front of the train, rather than the back, seems to deliver more airtime and a more intense ride. Nitro sits at the back of the park. Its massive yellow and purple track snakes through the woods outside Six Flag’s gates. The ride retains a bit of mystery since passengers can’t get a good sense of its layout until they’re on board and racing at hyper-speed. The unique and impressive design of the huge 36-passenger trains is evident as they pull into the loading station. The cars’ low-slung-sides and raised seats leave riders exposed. Since there are no inversions, there are no over-the-shoulder harnesses. A single, unobtrusive T lap bar ratchets Nitro’s passengers into place and contributes to their sense of vulnerability. There are no jogs at the apex of the lift hill. Nitro proceeds straight into a 215-foot drop and accelerates to a bone-rattling 80 mph. It immediately shoots up a second hill for some delirious airtime. From there it takes a left turn into the wilds of New Jersey. The coaster then navigates a series of hills that alternately deliver rib-crushing positive G-forces followed by the sweet release of floating airtime. After the horseshoe-style turnaround, Nitro enters into a double helix for some intense positive G-forces—a tad too intense for us. We are not fans of spiraling helixes, particularly on hypercoasters. We think they serve to sap a coaster’s pent-up energy that could be better used for more hills and airtime. The double-helix element interrupts the airtime-a-thon and brings an otherwise near-perfect coaster down a notch from a five-star rating. Nitro is similar to other hypercoasters, including Apollo’s Chariot at Busch Gardens in Virginia, Diamondback at Kings Island, and Mako at SeaWorld Orlando. All three rides share the same manufacturer, Bolliger & Mabillard of Switzerland, and are all stellar. Apollo’s Chariot Diamondback, and Mako give smoother rides (although Nitro is remarkably hyper-smooth), and forego the double helix for non-stop hills and drops. Nirtro makes it onto our picks for the best steel roller coasters. But the top spot on that list goes to another hypercoaster at another Six Flags park, Superman the Ride at Six Flags New England. That ride was built by a different manufacturer, Intamin. Ironically, the only other coaster among Great Adventure’s large arsenal to rival Nitro for a glass-smooth ride and wild airtime is El Toro, a wooden coaster. (Although, its unique hybrid track distinguishes it from typical rough-and-tumble wood coasters.) Both coasters deliver a heckuva one-two punch for thrill machine fans. Other notable rides at Great Adventure include Kingda Ka, one of the world's fastest and tallest coasters, and Superman Ultimate Flight, a flying coaster.